It is not known when stone quarrying started at Heddon but outcrops of sandstone here were probably used by the Romans. The main quarries were opened in Victorian and Georgian times. Killibrig Quarry, situated beside Close Lea, was started by the Edinburgh firm of Dobbie (or Dobie) in 1878 and was cut into the hillside next to what is now known as Slack's Plantation. It had a reputation throughout the north-east for it's fine quality building stone of which many buildings in Newcastle and elsewhere were built. It is said that the pillars for the Theatre Royal, St Nicholas Cathedral and Grey's Monument in Newcastle, buildings in Edinburgh, and the Woolwich Arsenal came from Heddon's quarries. The engine foundations still exist and the chimney was pulled down in the1980's, one hundred years after the quarry was opened. The chimney used to bear the inscribed date of 1878, when operations commenced. The name Killiebrigs, used for a street on the modern housing estate just to the north of the quarry, has always seemed to me to sound more Scottish than Northumbrian so perhaps this is explained by the Edinburgh connection. The other street names on that estate all have Roman connections. The stone was carried in wagons, down the incline from the quarry, to the corner of the Close House cricket ground and then eastwards by the Low Wood by Heddon Colliery engine through the pit yard and from there to the jetty for transporting down the river in wherries to the coal staithes in Newcastle. Did stone form the quarry go all the way to the Lemington staithes used by the Wylam Colliery or was it loaded on boats via a jetty close to the Tide Stone via a branch of the waggonway through Cathouse Plantation? There is an old photo showing a tunnel entrance on the river bank 'at point where the railway ended' but this is no longer visible and the exact location uncertain. Old maps don't offer any help. 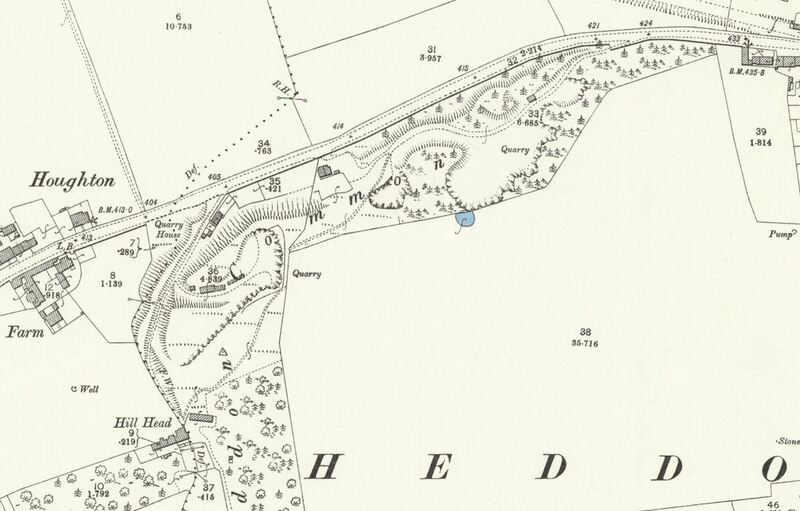 See the blog article on the Hedwin Streams Railway for more information. A large quarry and two smaller ones were also worked on the north side of the common, by Messrs. Hunters, stone masons of Hill Head, Houghton. 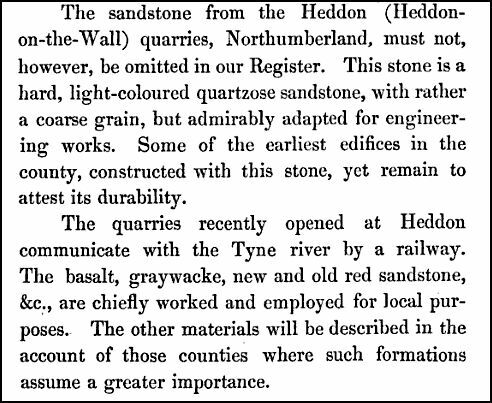 Stone from these quarries was used in the construction of Wylam Institute and St Mary's Church, Throckley and many other local buildings. All quarrying in the village ended about 1930. The two large quarries on the Common were used by the local authority as landfill sites between 1965 and were completed in about 1980. Heddon Quarry. OS 25inch; Revised: 1895; Published: 1897. The Architect, Engineer, and Operative Builder's Constructive Manual by Christopher Davy (1841) ref. by William Laxton (1839) ref. On Saturday morning at ten o'clock, an accident by which three men were seriously injured occurred at the New Quarry, recently opened at Heddon-on-the-WaIl, by Mr J. Waddell, contractor, Edinburgh. The men were engaged in blasting the stone, and the shot not firing at the proper time they went to the spot, and while engaged drawing the stemming, the shot fired. There was no time to make a retreat, the only warning being the moving of the rock on which they were standing. One of them was heard to exclaim, "Lord have mercy upon us,” and the next instant they were thrown about five yards in the air, and fell heavily upon the broken stones. Mr Mackie, the resident manager was on the spot, and he sent for medical assistance and had the men conveyed to their homes. Considering they were using 31/2lbs of powder it is marvelous they escaped with their lives. As it is, they are seriously injured and grave fears are entertained that two of them may lose their eyesight. The names of the injured are:—Henry Garnett, WaIbottle; Hutton Robson, Heddon; and a man named Andrew living at Blue Bell. The two first are severely injured in the face and are blind, and the latter complains of a pain in his side. Under the care of Dr Atkinson of Wylam they are progressing as favourably as can be expected. Updated information from 2014 on Heddon on the Wall quarries can be found on the blog.